We really like the idea of the seasonal aspect. That was one of our favourite things about The Last of Us as well. Sounds epic, loved the other two. Well up for this. Don't play many FPS but I'm really stoked for this. It looks awesome. One of the most under rated series in gaming and I can't wait for Exodus - Day 1 for me. So this will be < £20 come Black Friday 2018. You'd think publishers would've wised up by now. @Fight_Teza_Fight - seems like a bold move for sure. next autumn will be occupied by other heavy hitting FPS.. treyarch's follow-up to BlackOps3 (the biggest selling CoD to date), probably the next installment in the Battlefield franchise, even more Destiny 2.. and it's not like metro last light was a massive seller to begin with. last light bored the a*se off me, but this looks better/more varied. 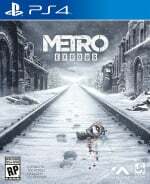 Looks really good, always loved the other 2 Metro games, can't wait to get into this one.